Today, a short post, for a change. you want to add your name to that post, which is here. collection from Purple Onion Designs. Hope you're having the loveliest day! so cute! Love your stitched swirl! Short and sweet annnnnddddd stinkin' adorable!!!! Love it. supah cute!!! love how you colored him and of course your signature stitching!! awesome!!! hope your day is wonderful sweetie! This is a GORGEOUSLY CUTE little card. You are so talented, thanks for taking the time to share that creativity with us all. Oh, Mel, this is clean and simple at its BEST! Amazing stitched sentiment, and your coloring on that adorable Peep is phenomnal! Wow! Cute bird and a cute card! Darling card! LOVE your stitched hello. Adds a great texture and makes a fabulous branch! Peep is adorable! Can't wait til the 17th to see the whole release! I am keeping my fingers crossed for this precious bird. I would love to make a home for him/her. I saw this on the POD Blog and it took my breath away! So beautifully coloured and that stitched sentiment is simply genius! Spectacular creation. Your coloring and stitching are fabulous! Adorable card Mel! Such a cute little image and LOVE the stitched hello. LOVE the stitched "hello"! Such a wonderful touch! 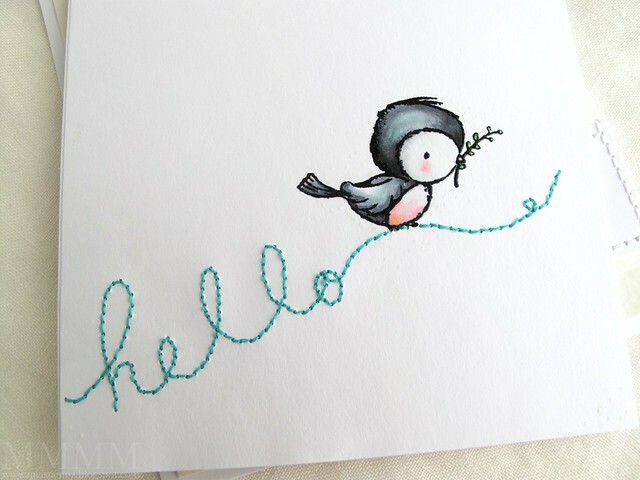 Stitching "hello" makes this adorable bird even more adorable! Love this card and love this birdie! So adorable! LOVE how you stitched the hello. Just perfect! So inspired by your stitching, you must have so much patience! That stamp is super cute too! 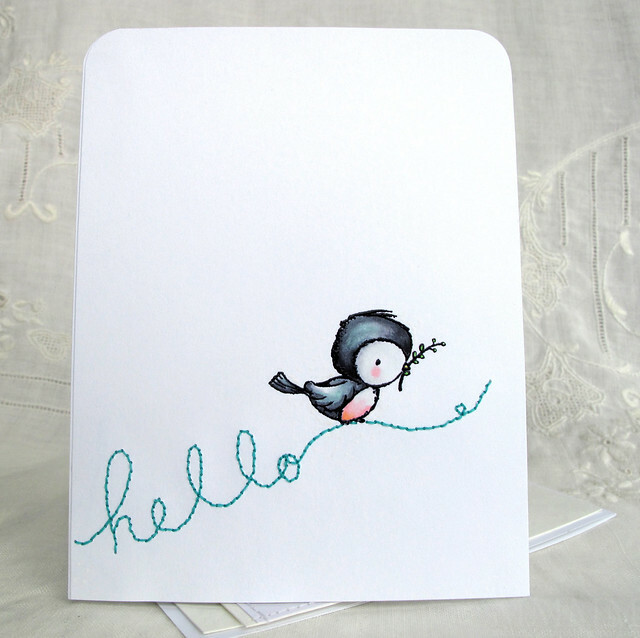 That little peep is precious and the stitched sentiment is a perfect finish to your card. Super sweet! I love how simple this is!! TOO CUTE girly!! Miss ya! Mel, I love this card! The bird is so sweet and your stitching is gorgeous! Love your card. Stitching looks great. Wonderful!!! Your stitching is incredible. What a cute card...love your stitching! Very cute birdie and I like the stitched hello. super cute card and birdie image!!! Peep is so cute! And your stitching is perfect, you have WAY more patience than I do! Super simple but still over the top pretty-ful! Love the stitching and beautiful colouring too. omygosh! I love sewing on my cards but this kind of sewing NEVER occured to me. When I saw this, I had to get off the floor and climb back into my chair. It's amazing!! I have no idea if I can get a look like this, but I am sure gonna try it out. This is GORJUSS!! So stinkin' cute! I love the texture from the stitched sentiment combined with the soft coloring on Peep. Simply sweet! That adorable little birdie and the card. Such a cute cute bird! Happy birthday (i'm sorry to be late - but we had Easter these days)!! !